A lot of you want to have a home office no matter how small the size is. That is because you want to be able to do some of the work that you bring home comfortably. But the problem is when you have small size house with limited space; will you still be able to have a home office? Actually a home office can be made using as minimum space available in your house if you know what to do. 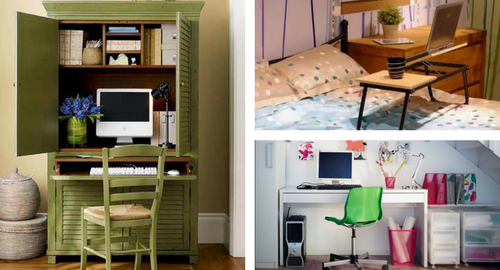 Here is some small home office design that you can use to create a private office in your small house. Small house usually have small stairs but you should still make use of the small space underneath the stair. This could really be the best small home office design since you can make use of a space that you might not use otherwise. Try to put shelf on the wall as a storage solution then add a counter a few inches above the floor. Under the counter could also be use as storage, so do not forget to also install some shelf there. Even though this space is small, you can still use it comfortably. If you have an extra closet that you do not really use, or you can move the items somewhere else, then you should really try to make small home office design closet. The space inside the closet would be enough to be a nice office, furthermore there are already some shelf inside the closet. You can just adjust the shelf height according to your need, and then add a counter or a table inside the closet to be your office desk. When not in use, you can close the closet door to hide the office from view. For you who really do not have any place to be remake as an office, there is another day that you can try. That is by making a small home office design cabinet where the office is hidden inside the cabinet. That way you do not need any other space in your house to make the office and just open the cabinet when you need it. Make a counter from the cabinet shelf, and then just put your computer or laptop inside. There are a lot of shelves inside the cabinet that you can also use as storage. If you really do not have any place to even put a cupboard in your small home, then you can try to use portable laptop desk as a working place. This small home office design ideas can be used for anyone and you do not even need any space to do it. You can find a laptop desk to be use with your sofa called the C table. There is also small portable laptop table that you can use in your bed so you would be more comfortable working. Even if you have enough space to set up an actual office in your small house, but you still need to consider the furniture you want to use. The small home office design that you should use is by choosing office furniture set with caster. By using this kind of furniture you will be able to move them anytime, so when they are not in use you can keep them in unused corner so they would not get in your way. Furniture without caster would be harder to move, so if you already have them beforehand try to install the caster yourself. Actually you can set up your office in any area in your house that you do not use. Try to make use a small corner that you do not know what to use it for, or you can also try to use the space in front of your window. Do not use big furniture that you do not even need since it will only make your room looks crowded and make them even smaller. Choose furniture with suitable size, small furniture will do as long as you can use it efficiently. Before you purchase any furniture for your house, you need to plan everything beforehand so you will know what kind of furniture you need for your home office. Sometimes you do not even need a desk since you can just use a shelf or counter as your desk. This is why planning is necessary so you would not get furniture with wrong size. If you cannot find furniture that is small enough to fit into the space you have in your house, then you can always order small home office design custom furniture to use. Using custom furniture will allow you to modify the shelving, color, and size according to your space.